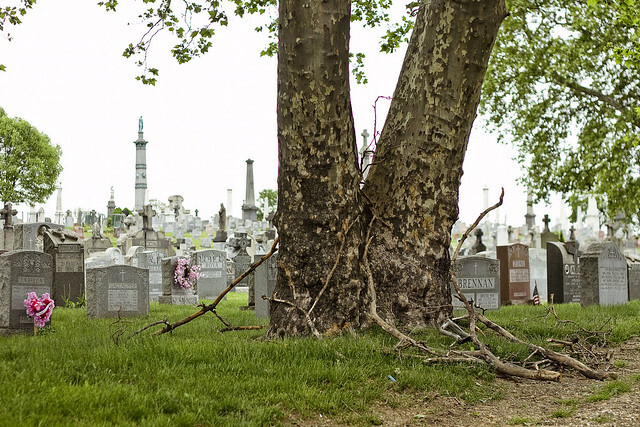 Calvary Cemetery in Blissville, in today’s post. Happened across this extraordinary monument over in Calvary Cemetery the other day. 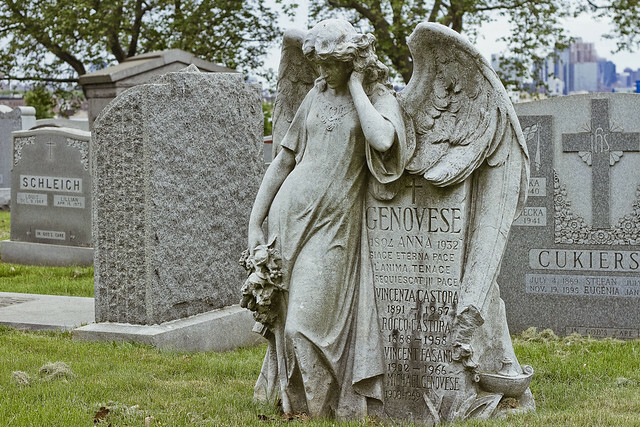 Depicting a weeping angel holding a bouquet of flowers, the top name on the stone is “Anna Genovese.” A bit of research was conducted on the name and year (1932), which unfortunately coincides with the second marriage of gangland leader Vito Genovese to a woman named Anna. 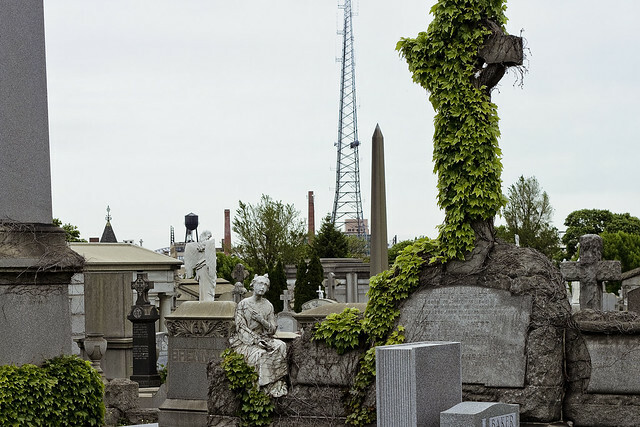 Vito and Anna are actually in St. John Cemetery here in Queens, so this monument wasn’t erected in memory of Mrs. G.
It is a pretty Angel statue, however, and far enough away from the Newtown Creek side of Calvary to have largely escaped the acidic effluents of the Phelps Dodge refinery. The south eastern side of the cemetery exhibits stones which have the appearance of melting ice cream due to this effect. Granite is largely unaffected, of course, but Marble and Limestone alike exhibit pitting and decayed surfaces. One realizes that angels represent the beatific and divine to people, but the whole concept gives me the willies. Over the years, one has indulged in studying the belief systems and bestiaries of the major religions, and a particular study has been made of the lore surrounding the so called “sons of fire” commonly called “Angels” and “Demons.” The Angels are, after all, the demons of God. Like Demons, Angels have naught but contempt for the “sons of clay” known as Men. 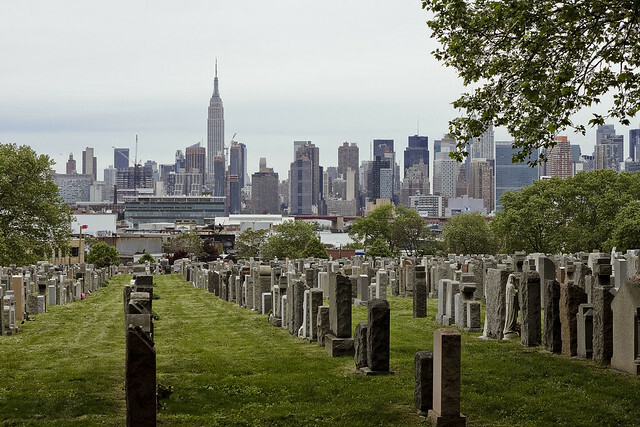 As a note, according to the last Spider Man movie, the section of Calvary Cemetery pictured above is where you’ll find the grave of Peter Parker’s Uncle Ben. This odd arrangement of branches had nothing to do with Angels, I’m sure. Likely it’s a grounds keeper who recently watched the Blair Witch Project movie. My take on Angels actually angers the religious folk out there. When asserting that the greatest and most loyal of the Angels is actually Lucifer – the original version of the “fall” story wasn’t the medieval Aquinas telling of a rebel prince denying his feudal master – instead it involved a divine command, offered to the assembled host of Angels in Eden, to “love” the Adamic pair and their offspring as if they were the creator deity itself. The Angel Lucifer questioned how he and his brothers could love any as much as they loved God itself, and it was the act of reason and doubt which damned both he and the fallen. Some early versions of the tale see Lucifer as actually volunteering to play the role of adversary, as his God deserved a better enemy than the primeval “opposite” entity called Satan. The Angels are meant to be asexual, incidentally, but usually referred to with male pronouns. Not Hermaphoditic at all, the race of Angels are instead meant to display qualities common to both human sexes, but are thought to be entirely “smooth” downstairs. Of course, the idea of a winged humanoid is likely an oversimplification for describing an extra dimensional race capable of evading the Newtonian laws of thermodynamics. In occult circles, the theory that all the human mind is capable of, as far as interpreting and visualizing the totality of the “sons of fire,” is the form of a winged medieval knight. Same thing with the God entity, which is so totally alien that all we are capable of seeing is a “burning bush.” It’s literally beyond human cognition, the supranatural. I know, pretty deep stuff for a Tuesday. Tomorrow – something more concrete, steely, and material. You might be interested in Lee Brown Coye illustrations featuring sticks based on an unusual discovery he made while hiking in upstate New York. Karl Edward Wagner employs elements of this in his short story Sticks and in the epilogue gives a few more details about Coye’s work. Middle Eastern lore describes the Djinn as formed of smokeless fire. Like Man, formed of clay, the Djinn have free will and are subject to God’s judgement as is Man. It’s more common in Christian lore, specifically Catholic of which I am more familiar with, that angels are formed from fragments of God’s own being and are considered to be formed of light, not fire (refer to the above Djinn), and are themselves pure love. The angel does not have free will, i.e. it is an amoral being not capable of moral choice and cannot do other than obey the word of his creator. As an aside, where God is considered to have perfect knowledge, angels according to their ranking, or power level if you will, have varying degrees of near-perfect knowledge. We’ve had many interesting discussions about this topic and if we accept the premises I’ve outline above as correct then this creates what I call the Lucifer Paradox. I’ll refrain from the gnostic light/shadow dual nature of God which might offer another solution to the devil paradox as a discussion for another time. A being that does not have free will cannot any more disobey or even question his creator than your laptop would refuse to execute a program. Nor could he “volunteer” to do anything, he must be commanded to be the devil that tempts Man to evil as other angels commanded to persuade Man to good. So I question the Church’s teaching about the sin of pride, fall from heaven business as it flatly contradicts other Church teachings on the origin and nature of the angels. They tend to call such paradoxes and contradictions “mysteries” and offer no further explanation or clarification. And I still do not find your argument about Lucifer’s fall due to his confusion over God’s command to love Adam as much as he loves God- Mitch’s HAL-9000 Hypothesis- to be logically consistent as I will explain. We take the following premise accepted by the three Abrahamic based religions that God is an infinite being, perfect in all respects including infinite and perfect knowledge of past, present and future. If an omniscient God cannot predict Lucifer’s confusion and subsequent malfunction over the aforementioned command, then how can God be omniscient? If an omnipotent God cannot repair or rectify or at most destroy a defective or malfunctioning angel, let alone that a perfect God create a potentially defective angel, then God cannot be omnipotent nor perfect (as the angel was created from a fragment of God’s own being). Either condition implies a God that is less than perfect and flatly contradicts Judeo-Christian and Islamic teachings about the nature of God. Therefore, angel or devil can logically only be at the direct command of God. No choice, no confusing trick questions necessary. Such trick questions makes God seem like Mitch writ large, or some street guy from Brooklyn: Wrong ansah! Yer outta heah, pal! God as Mitch or Leo Gorcey- a truly frightening thought.